Hello everyone! I sure have missed crafting and blogging this past week. My holiday weekend was full, and I spent all day yesterday after church up in my attic, cleaning and tossing. A dirty job, but I had to do it. I couldn't even reach my Christmas decoration boxes. That's how out-of-control things had gotten. This card is my submission for Round 3 of the Clean and Simple Design Team Search at Splitcoast. I'm so happy to have made it this far! This is the final round, and winners will be chosen this coming Friday, 12/3. My competitors are amazingly talented. It must be very difficult to make the decision! About the card: I embossed a pearly, shimmery piece of designer paper (that I bought today with Andrea) using my new Northern Flurry embossing folder from Stampin' Up! Using a Spellbinders die, I cut a circle from the same shimmery paper, then used the Tight Mat Tutorial by Becca Feeken to make a circle out of plain white cardstock. I adhered a beautiful, silver snowflake sticker by Jolee's Boutique (another purchase from today) onto my circles. The satin ribbons and silver cording are scraps. I'm entering this card at Mark's Finest Papers challenge #31 - have a bow on your card; Stampin' B - make a holiday card; Alphabet Challenge Blog - E is for Embossing; Flourishes' Bring Back Beautiful #4 - use ribbon; and Really Reasonable Ribbons blog - Christmas card with ribbon. The above photo shows the shimmery paper best, I think. The following card helped me win last week at The Play Date Cafe, where I earned a 'Cream In Our Coffee' badge. To be honest with you, I wasn't all that crazy about this card. I can't believe it won. You never know, right? And at EtsyInspired, this card earned me the Shop Prize! Okay, I am done rambling. Thanks for hanging in there! OMG, I knew I loved that tree card for a reason. You are really raking in the rewards..2 cards this week. You go, girl! Glad you got to meet your friend, Andrea..what fun you two must have had. The CAS card is just magnificent. What a gorgeous sticker you have used and the embossing folder is yummy Nice shimmer going on, also. Good luck!!! Great Christmas card Colleen! Thanks so much for joining our Really Reasonable Ribbon challenge. Beautiful cards I love the snowflakes, really pretty! Wow, I love all three of these, the snowflake card is so pretty. Sounds like you had fun meeting your on line friend, that is so amazing to meet someone on line and then see them in person. Okay, well, I have to tell you, I met my husband on line, lol, so you never know right? And now your attic is clean too! Wow, you have been busy. Oh Colleen! This turned out great! 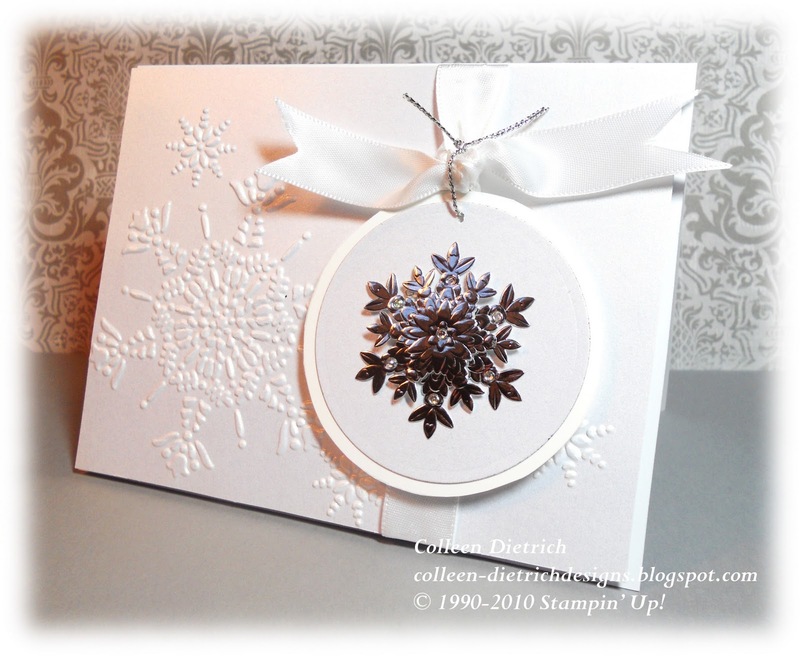 Wonderful shimmery paper, just right to showcase that shiny snowflake! Perfect choices today! I'm actually surprised that we were able to focus on shopping with all of the talking we were doing! It was great to meet you in person and we will definitely get together again soon! I'm gonna check out some scrapbook stores in the area so we have a plan. Then shop, talk, shop, talk...etc! Good luck on your entry, they've got to be crazy if they don't choose you...that card is the epitome of CAS...and elegance. I'm jealous!!! Andrea is such a sweat heart I would love to meet her (and you!) in person. Problem is the 3000+ miles between us :( Glad to hear you had a wonderful time together. Beautifully elegant! Thanks for playing with Speedy's friends! Very fun you 2 got to meet! Beautiful cards. Thank you for joining Speedy's Friends. Congratulations on BOTH of your other wins, too!! YAY, you!! Can't wait to see your EIC prize--that sounded so cool. I hope you'll post a photo sometime!! Your visit with Andrea sounds heavenly!! I hadn't realized that the two of you had never met--how fun that you finally did! I sure wish we lived closer so that we could do the same sometime :). This is really beautiful!! Thanks for joining us at The Alphabet Challenge!! this is gorgeous...so elegant....I found your blog while visiting sweet Andrea...looks like you two hit it off great....have a wonderful week! Colleen this is a Fabulous Stunning CAS card! Good luck with round three. Colleen I am glad I stopped by your blog this morning. Seeing this card up close and personal has made me appreciate it even more than I did on SCS. WOW girl-this is gorgeous. The details and design elements are extraordinary. Congratulations on you wins...but that doesn't surprise me-your work is impeccable. Good luck on the CAS competition. Wow!! Such beautiful projects, Colleen! I love that embossed silver snowflake on the first~ it's stunning! What a pretty selection of cards, especially your snowflake one, it's gorgeous!